Wildlife images of bears, bison, foxes and more! A bull Rocky Mountain Elk, sporting new velvety spring antlers, keeps a watchful eye over landscape. The Rocky Mountain Elk was re-introduced in 1913 to Colorado from Wyoming after the near extinction of the regional herds. 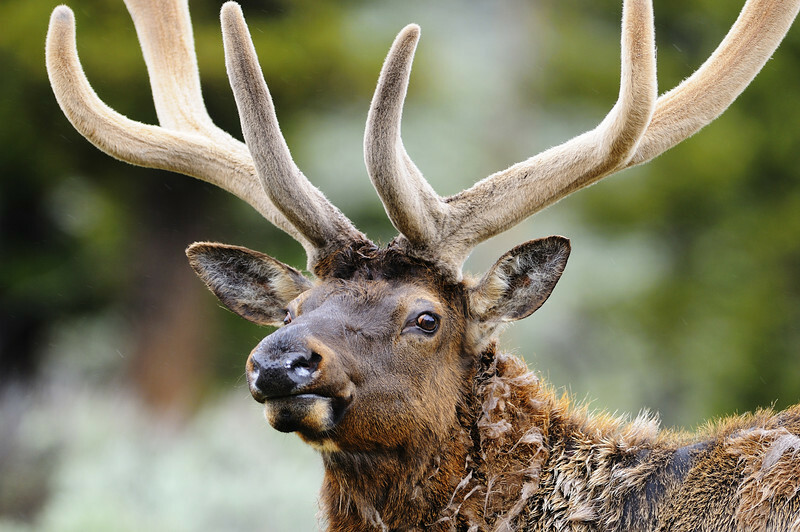 While over-hunting is a significant contributing factor, the elk’s near extinction is mainly attributed to human encroachment and destruction of their natural habitats and migratory corridors. Today, Elk populations have rebounded in the two states to over 385,000. The recovery of elk to this area of the country has been key to the return of predator species such as the Grey Wolf, which now help to keep elk populations in check.